Fact is that nothing looks like real metal except real metal. And Micro Foil Adhesive is a very easy and very inexpensive way to apply real metal in the form of metal foil to your models. Fact is that nothing looks like real metal except real metal. 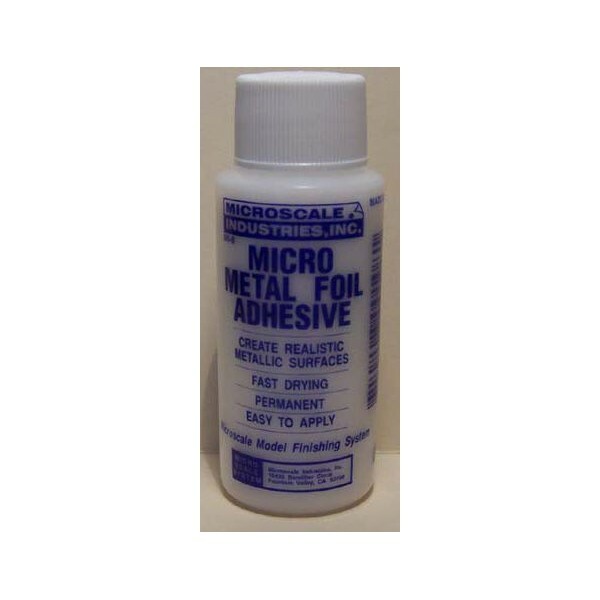 And Micro Foil Adhesive is a very easy and very inexpensive way to apply real metal in the form of metal foil to your models. The most common foil is ordinary household foil which most people have at home. But with a little checking around you will find that there is also stainless steel foil, copper foil, etc. The softer and thinner foils are the easiest to use, but the surface you want to metal clad is not too tough, you can use anything. Application is simple : getting a soft flat type brush that doesn’t shed hair is the first thing. Polyester bristle works best. Then find a clean place where you will not pick up particles that could get under the foil and cause tiny lumps. The rest is simple. Apply as thin a coat to the back side of the foil as you can. Household foil usually has a dully and a shine side, coat the opposite of the one you want. Let dry 15 minutes or until the adhesive is clear, not milky. Try not to get anything get on the tacky Micro Metal Foil Adhesive at this time. On large surfaces you will have to use pieces of foil cut roughly to size. On smaller any piece big enough to cover will do. Wipe of the surface on the model with a tack rag or a very slightly damp clean lint free rag. Place the metal foil with the tacky side down on the area you wish to metalize as flat as you can so as not to trap air. Then using your hands, which should be clean and free of adhesive, carefully press the foil to the surface. You should start at the center and press to the outside. Start out very gently at first and then a little firmer. Don’t press too hard, but the more you can do now the faster it will go. When you have done all you can do, get an ordinary cotton swab on a stick, and work over the areas you have not gotten down. When you have done all you can do this way or the job looks right, the you’re done. On highly detailed models this will not be enough, and you will need some wooden tooth picks. The round kind work the best for most things. Here you will have to be most careful because if the tip of the tooth pick is too sharp, then you could gouge the soft aluminium. You will then have to replace at least a portion of damaged area. So you will do best by checking the tooth picks for sharps edges and using fine sandpaper to round the edges to fit the shapes you will be using them on. Once you get the idea you should have no trouble at all, because it is really very simple and very effective. When you have the foil conforming perfectly to the model surface you can cut the excess away with a sharp pointed hobby knife. When done right you can turn a plastic model into a real looking metal model for just a few cents.